This quick guide will help you efficiently manage your appointments, tasks and events. When you look at the month view in CloudCal, you'll see circular graphics for each day. This is the Magic Circle. It’s basically a clock-face. The Magic Circle shows you instantly how busy you are and when you have free time. All-day events are shown with full circles. Magic Circles show everything happening in a 12-hour window, (9AM to 9PM) by default. You can configure your Magic Circles to show any 12-hour period, or the full 24 hours. One innovative feature of CloudCal is the ability to create events using natural language, which helps you save time and work more efficiently. "Lunch with Martin tomorrow at 1 pm"
"Cal dad every Sunday at 5pm"
"Do tax return on October 1st at 9am"
Smart Bot can understand due dates, times, and recurring events. Tap the insert button (+) to create an event in your calendar. Tap-and-hold on a particular day. The new event form will be pre-populated with your chosen day. Long-press the insert button (+) to create a task. Applicable only when CloudCal is used in combination with CloudTasks. Quick entry in day view: Long-press on a specific time when in day view. A pop-up will be displayed so you can refine the time and save your event. Swipe down to move backwards through time. Swipe up to move forwards through time. 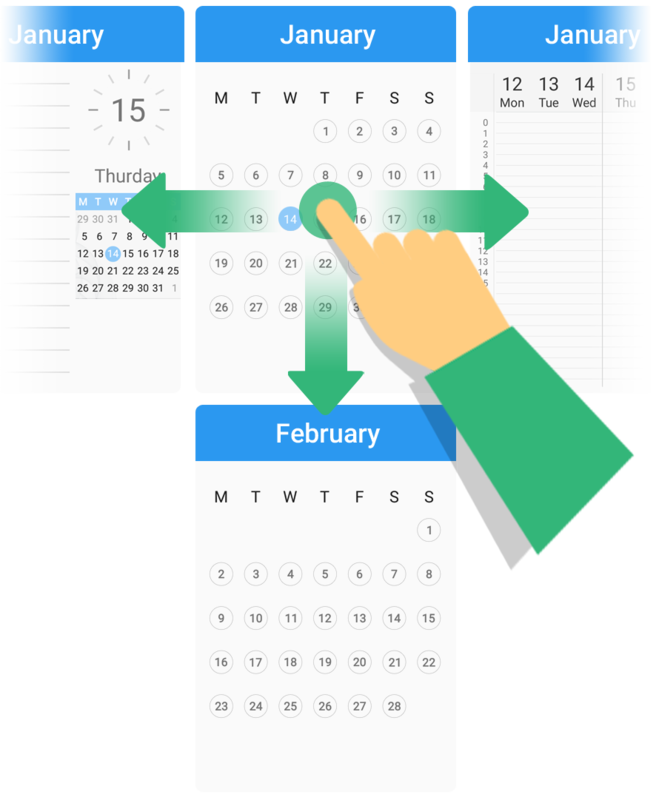 Swipe left or right to cycle through the three main calendar views. particular day before you swipe. You’ll land on the week or day you chose. CloudCal shows your week agenda as standard. You can choose a week view instead (in Settings). 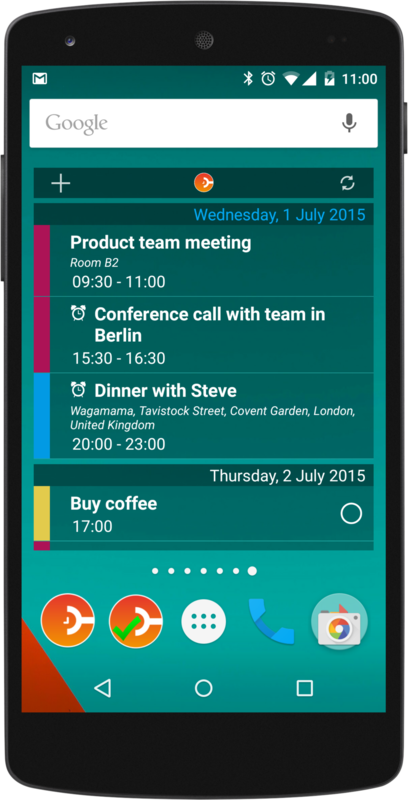 With CloudCal’s widget you can display your agenda on your device’s home screen. The widget gives you a full month of your events and can be resized to suit your needs. To make it fit your style, you can change the colour and transparency of the widget to your liking. To do it, head to Settings > Widgets. Choose CloudCal Agenda and/or CloudCal Month, and tap Background Colour. Pick the colour and change the transparency with the sliders on the right. Want to share a file or an agenda with your meeting attendees? Now it’s easy. Just attach files to your event. Attachments can also be a photo, a vocal message, a file residing in your device or any Dropbox file. 1. Tap the paperclip icon when you create or edit an event. 3. You can share attachments via email without having to share the entire event. If you share Dropbox files the other party will receive a link to your file. If you share a voice recording, photo or other file from your device the other party will receive the file. CloudCal integrates seamlessly with CloudTasks, the task and to-do list manager. With both apps installed, you can manage and complete CloudTasks to-dos right inside CloudCal - no need to switch between apps! When in the day or week view, simply double tap on a task to check it off. When it comes to organizing time with friends, family and colleagues, having contact information at hand can save a lot of time. By becoming a PRO user of CloudCal, your contacts will be autocompleted when you enter an event, making it easier than ever to set up meetings. To see the magic, start typing a person's name and tap on it when it shows. You can type a name into the title field to add details such as email address and phone number to the Notes field for quick action. You can also type a person's name into the location field to make their address the meeting point. Evernote integrates with CloudCal and you can create a reminder directly from CloudCal, or within Evernote. With Evernote and CloudCal, you can sync your to-dos both ways. Connect your Evernote account in CloudCal's Settings. Authorize CloudCal to connect with Evernote and you're set. Create your events in CloudCal, select the Evernote calendar from the top bar and set the reminder and it will be synced back to Evernote. Or create a note in Evernote set the date and time and it will show up in the Magic Circles, the agenda and the other views. You can create cards, assign teams and set reminders in Trello from within CloudCal. All your existing Trello cards are displayed along your calendar events in CloudCal's monthly, weekly and daily view on their corresponding due date and time. You can add reminders in CloudCal for each card and stay on top of all your to-dos. Connect your Trello account in CloudCal's Settings. Authorize CloudCal and Trello to connect and you're set. Tap on the floating button to create a new card, select in the top bar the Trello account, add team, board and reminders.